Dog Not Eating or Drinking Water - What To Do? If you notice your dog not eating or drinking water your dog is probably sick. Other sick dog symptoms include a change in activity level, diarrhea, vomiting, and seeming overall cranky. In the case of a sick dog vomiting, your dog not eating may mean that the dog is following its own natural wisdom or it could be a sign of something serious. A dog not eating much for a day or two is nothing to be alarmed about. But a dog not eating for more than that should see a vet. 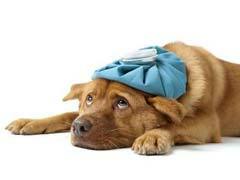 Dog health problems that don’t resolve in a day or two should certainly be brought to the attention of a veterinarian. If your dog’s symptoms come on suddenly and are extreme, including fever, don’t wait. The dog needs medical attention. If you live in an area where there are ticks, you dog could have Lyme disease. Dogs with Lyme disease appear stiff and almost lame. They may have a fever. If Lyme disease is diagnosed and treated early, the prognosis is good. Left untreated, Lyme can cause permanent joint and organ damage. Dogs have been known to ingest household chemicals that poison them including things like antifreeze! These common chemicals can kill your dog. Medical attention is required. A dog with rabies may not show symptoms for a while, even months. The dog may be lethargic, feverish, refuse to eat, and you may notice some changes in behavior. As rabies progresses, the dog will become very aggressive. If you suspect rabies you should call animal control and not try handling the dog yourself. Pancreatitis in dogs can also cause distress and severe abdominal pain. Low fiber and high fat consumption contribute to pancreatitis. The incidence of inflammation of the pancreas increases right after major holidays when well intentioned dog owners share their holiday meals with their pets!